Anthologies are fun to read because you get a taste of so many different authors. Plus they are short stories and it’s fun to take a break and read something short every once in a while. I think the problem with short stories is that you only have so many pages to pack a punch and make it memorable. The stories in Lore are based off different types of mythology and legends but giving them a new look. I often like my tales like this to be darker, I felt the stories even though they were dark were kind of light too. I know that might sound a little off. It didn’t bother me though I was okay with them even so. I guess the term I’m looking for is bittersweet. I enjoyed all of the stories but there were a few that really stood out to me. One of which was The Barricades. I really loved the whole concept of that story, I want it to be a whole book. It was a really great story. I also really enjoyed A Beautiful Morning because it dealt more with immortals/deities. I thought the story was both sweet and sad. It had an essence to it. I also enjoyed Shimmer because it was a fun take on the mermaid legend. Sunset Moon, The Maker and Between were interesting to me but didn’t stand out as much as the other three. Which happens with Anthologies. That’s what makes them fun. 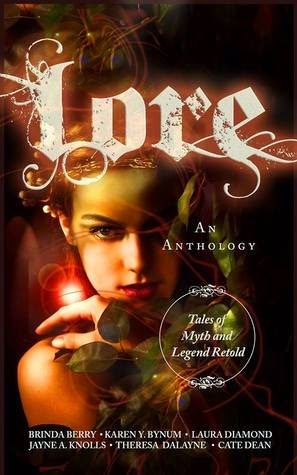 I think that if you enjoy myths and legend stories this a great book of retellings. I definitely felt the variety could fit multiple taste. I also thought the stories were well written and I liked how they had the mixture of darkness with a little light peeking through. Thanks so much for having us on your blog. Great review!